This extensive study centred on 2,328 chairside CEREC inlays and onlays which had been fitted to a total of 794 patients in a dental practice. Between 1990 and 1997 the CEREC 1 system had been used; between 1997 and 1999 the CEREC 2 system was used. Forty-four teeth were randomly selected and examined under a scanning electron microscope. The average margin width was 236 μm ± 96,8 μm. The success rate after nine years was 95.5%. Only 35 restorations failed, due mainly to the extraction of the teeth. There was no correlation between failure and the size or location of the restorations. This study centred on 1,011 CEREC inlays/onlays which had been fabricated for 299 patients between 1987 and 1990 using the CEREC 1 system. The majority of the restorations were made of VITA MK I ceramic; only a small number (22) were made of Dicor MGC. As from 1989 enamel etching (phosphoric acid) was deployed in combination with the dental adhesive Gluma. Glass ionomer cement was no longer used as the base layer. Areas close to the pulp were protected by means of a CaOH2 liner. The follow-up criteria were as follows: margin quality, change in vitality, tooth anatomy, complications, and failures. The findings were categorized according to the following parameters: restoration size, restoration location, initial tooth vitality, and the use of dentin adhesive. According to the Kaplan Meier estimator, the probability of success after 18 years was extremely high (84.4%). Premolars perform slightly better than molars, and 2- and 3-surface inlays better than 1-surface inlays. There is a significance between non-vital teeth (50%) and vital teeth (88%). The application of a functional dentin adhesive increased the success rate by 10% to 90%. The durability of laboratory-produced ceramic veneers has already been extensively researched. A group of CEREC veneers and partial anterior crowns was observed over a period of 9.5 years. These restorations had been produced on the CEREC 1 and CEREC 2 systems using VITA Mark II (mainly) and Ivoclar ProCad. 509 of the veneers had been bonded to natural teeth; 108 had been used to repair/ replace existing PFM or gold-composite restorations. After 9.5 years the restorations attached to prosthetic elements had a success rate of 91%, while those placed on natural teeth showed a success rate of 94%. Following the introduction of CEREC 2 dentists were in a position to produce full crowns in addition to inlays and veneers. In a further scientific study 208 CEREC crowns made of VITA Mark II were fitted to 136 patients using the adhesive bonding technique. Seventy of these crowns were placed on conventionally prepared teeth; 52 were placed on teeth with reduced stump preparations (low macroretention); and 86 crowns were placed on endodontically treated teeth. In this case the crowns included an additional post extending into the pulp cavity in order to achieve improved retention (endocrowns). The main causes of failure were fractures, presumably due to inadequate dentin adhesion. The “classic” crowns performed best of all (97.0% survival rate), followed by the “reduced” crowns (92.9%). The survival rate of the endocrowns was acceptable in the case of molars (87.1%) and relatively poor in the case of premolars (68.8%). 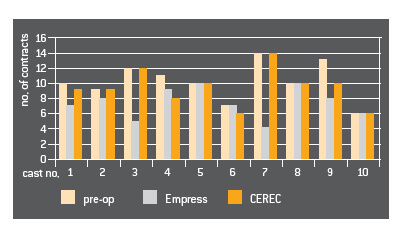 CEREC crowns also performed well in a study conducted in a dental practice. This study centred on 65 full crowns made of VITA Mark II which had been manually polished after the milling process and then bonded using dual-curing composite. Three failures were observed in the period up to four years (two ceramic fractures, one debonding). The success rate according to Kaplan-Meier was 95.4%. CONCLUSION CEREC crowns made of VITA Mark II and Ivoclar ProCad achieve success rates which are comparable to those PFM crowns. Long-term comparison of CEREC, laboratory-fabricated ceramic and gold inlays over a period of 15 years. For the past 15 years 358 two- and three-surface inlays have been under observation at Graz University in Austria. The following restorations were placed on vital teeth: 93 gold inlays cemented with zinc phosphate cement (= control group); 71 adhesively bonded gold inlays; 94 laboratory-fabricated ceramic inlays (Dicor, Optec, Duceram, Hi-Ceram); and 51 CEREC inlays (VITA Mark I). In addition, a number of non-vital teeth were treated: gold/ cement (5); gold/adhesive (14); laboratory-fabricated ceramic (22); and CEREC (8). The restorations were assessed according to the following criteria: loss or complete fracture; partial fracture of the restoration, the tooth or the cement/adhesive bond; secondary caries; loss of tooth vitality. A Kaplan-Meier survival analysis was carried out for each group. In all groups inlays placed on non-vital teeth performed worse than inlays placed on vital teeth. Initially the study included a group of indirect composite inlays. However, these were excluded prematurely on account of their very poor performance. 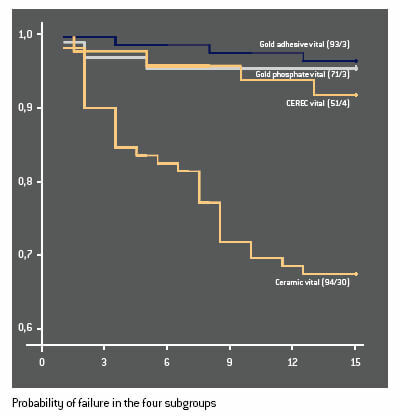 There was no significant statistical difference between the gold inlay groups and the CEREC inlays (success rate of approx. 93% after 15 years). The laboratory-fabricated ceramic inlays were clearly inferior (68%). CONCLUSION In terms of longevity CEREC inlays are on a par with gold restorations. The laboratory-fabricated ceramic restorations performed worse. The following ductile filling materials are used for posterior cavities: amalgam; glass ionomer and derivative products; and composites. In addition the following restoration types are available: gold inlays/ onlays; composite inlays/onlays; laboratory-fabricated ceramic inlays/onlays; and CEREC inlays/onlays. Long-term studies have been carried out for each group. CONCLUSION The success rates of CEREC restorations are marginally better than those of gold inlays/onlays. In times of financial constraint it makes sense to evaluate the longevity and cost of dental restorations – not in isolation but in combination – in order to develop cost-effective restoration options for patients. On the basis of billing data provided by a major German insurer the average fees and laboratory costs were determined for gold inlays (62), laboratory-fabricated ceramic inlays (87) and CEREC inlays (91). A meta analysis was then performed of ten suitable long-term studies from the period 1994 to 2003. This provided the basis for determining the statistical longevity of the various inlay types. CONCLUSION From an economic viewpoint CEREC inlays are preferable to all other inlay types. The precision of a milled CEREC restoration depends to a large extent on the quality of the data derived from the digital optical impression. The intraoral CEREC Bluecam has an innovative optical lens emitting blue light with a short wavelength. The scanning accuracy of CEREC Bluecam is approx. 19 μm. This high degree of precision is equivalent to that of the reference scanner*. Repeat measurements were in the region of 10 μm and the user influence was less than 12 μm. The results were not dependent on the type of preparation. The images with CEREC Bluecam were taken in auto capture mode and approx. 4–6 exposures were required per quadrant. The software automatically triggers the exposure when the camera is positioned absolutely still above the tooth. CEREC Bluecam demonstrates a significantly improved quadrant precision in comparison to the CEREC 3D camera (34 μm as opposed to 42 μm). The low values of repeat measurements of approx. 13 μm demonstrate the high accuracy of the CEREC Bluecam. The user influence on the precision of the measurement results was extremely low (approx. 15 μm). CONCLUSION The CEREC Bluecam generates digital optical impressions with an unprecedented degree of measurement precision. The precision of the CEREC system is determined by the resolution of the CEREC camera (25 μm) and the reproducibility of the milling unit (± 30 μm). Excluding user-induced influences (e.g. preparation, powdering and exposure technique), the precision of CEREC 3D is in the range ± 55 μm. The marginal accuracy of milled CEREC restorations has continu-ously improved with each successive software version (from CEREC 1 to current version of CEREC 3D). With regard to the hardware, the introduction of the step bur (tip diameter: 1 mm) represented a major improvement. Within the framework of this multi-centre trial (seven universities) the marginal fit and internal adaptation of CEREC full crowns were measured and compared with laboratoryfabricated ceramic crowns. A group of trained CEREC dentists and a group of non-trained assistants each designed and milled ten molar crowns on the basis of standard models. The crowns (made of the VITA Mark II and Ivoclar ProCad materials) were placed with the aid of Variolink. Empress ceramic crowns sourced from a reputable dental laboratory were also placed. The marginal fit of the dentist’s crowns (61.6 ± 27.9 μm) and the assistants’ crowns (60.8 ± 20.5 μm) did not differ significantly. The margins of the laboratory-fabricated crowns were slightly wider (69.1 ± 26.9 μm), which, however, was not statistically significant. With regard to their axial wall adaptation the CEREC crowns were clearly better than the laboratory crowns, whereas in terms of occlusal wall adaptation the laboratory crowns performed better. 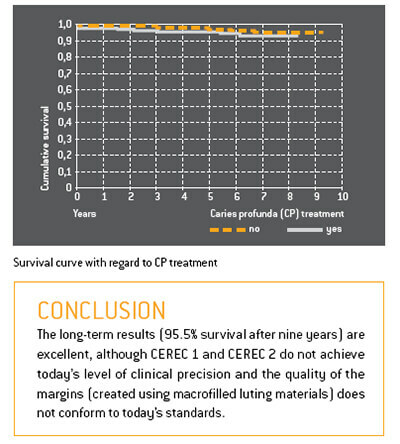 CONCLUSION The marginal fit of CEREC crowns tends to be better than that of laboratory-fabricated ceramic crowns. The performance of the luting materials and the chosen bonding technique have a decisive impact on the success of all-ceramic restorations. Metal restorations rely principally on macroretention. By contrast etchable all-ceramic materials (silicates/disilicates) are luted directly to the hard dental tissues and rely on microretention. 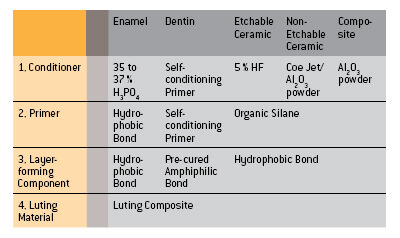 The bond-ing of CEREC restorations (VITA Mark II, Ivoclar Empress CAD) does not differ from the bonding of laboratory-fabricated inlays, onlays and veneers made of comparable materials. This procedure has remained virtually unchanged since the introduction of dentin adhesives in 1991. The first step is the CONDITIONING (e.g. etching) of the enamel, dentin and ceramic with the goal of creating a clean micro-roughened surface. This is followed by the application of a PRIMER, the function of which is to make the clean surface wettable for the hydrophobic bonding material. The third logical step is BONDING – i.e. the application of an unfilled bonding resin, which forms an intermediate layer between the tooth surface, the luting composite and the ceramic material. Older adhesive systems consist of separate products for each of these steps. The newer systems try to reduce the number of bottles needed. CONCLUSION The adhesive bonding of silicate ceramics has been proved over a period of many years. The various materials must be carefully matched. High-strength oxide ceramics such as inCeram, aluminium oxide and zirconium oxide do not lend themselves to etching and hence can be conventionally cemented. Self-adhesive luting materials have meanwhile become available. Luting composites fall into three different categories: chemically cured, light-cured and dual-cured. This ten-year study compared CEREC 2 inlays which had been luted either with chemically cured or dual-cured composites. The success rate after ten years was 77% in the case of dual-cured composite and 100% in the case of chemically cured composite. CONCLUSION Dual-cured composites should be used only in situations in which chemically cured or light-cured composites are un-suitable. Shortly after the introduction of CEREC there were naturally no long-term studies to draw upon. It was therefore necessary to establish whether the width of the luting interface (i.e. the thickness of the luting composite layer) had any influence on the marginal seal. All the investigations showed that it was advantageous to locate the restoration margin in the enamel. This in vitro study (which involved dye penetration tests) showed that the thickness of the luting composite layer did not have any influence on the marginal seal. Subsequent long-term studies of CEREC 1 and CEREC 2 restorations confirmed these findings. CONCLUSION The thickness of the luting composite layer does not have any influence on the marginal seal. In relation to deep cavities the question is whether a liner plays a beneficial role for the protection of the pulp. According to a study carried out by N. Krämer/Erlangen the occurrence of initial hypersensitivity doubled in cases where a liner was laid. The failure rate of ceramic inlays (in this case Empress) trebled when a liner was deployed. Various Empress inlays placed using Variolink low (low viscosity) and Tetric (high viscosity) were measured in order to determine the wear of the luting composite in highly loaded areas. The two different composites did not exhibit any significant statistical differences. CONCLUSION Low-viscosity and high-viscosity composites are suitablefor the placement of CEREC inlays and onlays. Temporaries and methods of bonding labside and chairside produced ceramic inlays have a decisive influence on enamel defects and the margin quality. nlay cavities treated with temporaries demonstrate, after simulated temporary wear in a chewing simulator, a deterioration of the enamel integrity. In particular in both oral and vestibular surfaces cracks developed. By cavities treated immediately with chairside produced ceramic inlays no such enamel defects arose. CONCLUSION Chairside produced CEREC inlays offer the treated tooth a reduced risk of enamel cracks, due to there being no provisional. The analysis of bonding systems demonstrated that conventional bonding is still superior to self-adhesive systems. Selective enamel etching as used with CEREC inlays enhances the bond with the hard tooth tissue and improves the quality of the enamel margin. In contrast to the general assumption a broader adhesive gap does not result in inferior margin quality. Measurement results of damage to the enamel marginal edge (with or without temporaries). 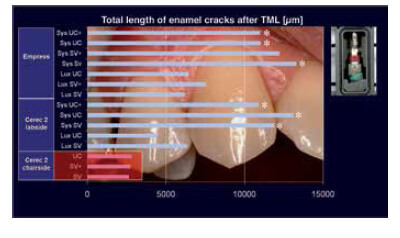 Chairside ceramic treated cavities show fewer enamel cracks [TML: thermocycling and mechanical loading]. CONCLUSION Immediate treatment without temporaries has a stabilizing effect on the tooth substance. Attainable bonding technology takes into account a broader adhesive gap. The current version of CEREC 3D includes a variety of tools for mapping the patient’s occlusion and articulation (static and functional) and for the automated design of the occlusal surfaces. - The DENTAL DATABASE contains various sets of data which can be selected according to the specific situation. - CORRELATION creates a precise and adjustable copy of the existing situation. - REPLICATION enables the dentist to create an optical impression of any chosen occlusal surface (either contralateral in the patient’s mouth or from a separate model). This optical impression can then be placed manually on the preparation. - ANTAGONIST maps the static occlusion of the antagonists. - ARTICULATION maps the surface of a functionally generated path (FGP). Number of occlusal contacts of the casts before and after placement of the different crowns (contacts of the restaurations excluded!). By combining DENTAL DATABASE, CORRELATION/REPLICATION with the ANTAGONIST and ARTICULATION tools the dentist is in a position to create functional occlusal surfaces on the computer monitor – manually, semi-automatically or automatically. These occlusal surfaces require only very little subsequent adjustment. The manual reworking requirement can be reduced from approx. 400 μm (DENTAL DATABASE) to approx. 5 μm (CORRELATION plus ANTAGONIST). Provided that the equipment parameters are set properly, the dentist can dispense entirely with manual corrections. CONCLUSION Precise occlusal surfaces can be designed on the computer monitor. These require practically no subsequent adjustment in the patient’s mouth. CEREC inlays and onlays can be characterized with the help of ceramic stains. After they have been glazed they can be placed in the same way as laboratory-made ceramic restorations. Due to the special qualities of the CEREC ceramics (chameleon-like shade adaptation; wide choice of lightness, translucency and colour shades), staining is not necessary in most situations. The CEREC ceramics are easy to polish. In most cases the surface finish is in no way inferior to that of a glazed restoration. Various studies testify to the good shade adaptation of CEREC ceramics. According to the criteria of the California Dental Association (CDA) 87% of the restorations were rated as excellent. According to the USPHS, the surface characteristics and shade adaptation of all the tested restorations were judged to be excellent or clinically good. CONCLUSION If the ceramic materials are correctly chosen and properly polished, laboratory staining and glazing are unnecessary in most cases. After they have been milled CEREC anterior crowns can be stained and glazed. Alternatively, they can be incisally trimmed and then layered using a transparent ceramic material (in cases where especially transparent incisal surfaces are required). Thanks to their graduated shading intensities, polychromatic blocks (e.g. VITA Triluxe or Empress CAD Multi) make it easier to imitate the natural teeth. Shading pastes (e.g. VITA Shading Paste, Ivoclar Shade and Stains Kit) and shading powders (e.g. VITA Akzent) permit the rapid characterization of anterior crowns. In simple applications shading and glazing can be combined in a single operation. Multiple firing operations are possible. The CORRELATION programm allows the shape of the restoration to be simulated prior to milling. In many cases it is possible to create and place chairside anterior crowns during a single appointment. More sophisticated layering techniques are possible. However, these usually necessitate an indirect procedure using a physical impression and a cast model. Highly complex characterizations can be achieved in this way. CONCLUSION Anterior crowns pose a challenge which can be accomplished during a single appointment with the help of polychromatic blocks and various characterization techniques. More and more CEREC users are offering veneers as part of their treatment repertoire. Partial anterior crowns and veneers are frequently used as a tooth-conserving alternative to a full crown. Characterization can be performed using the methods described for anterior crowns (ceramic stains in combination with transparent ceramic layering materials). In addition, “background shading” can be used in order to achieve natural-looking results. In this case composite shading materials are applied to the rear surface of the milled veneer. After the veneer has been placed this shading is visible through the thin sliver of ceramic material. Fine-tuning, contouring and high-gloss polishing are performed after the veneer has been bonded to the tooth. The time input corresponds to that of a CEREC inlay. 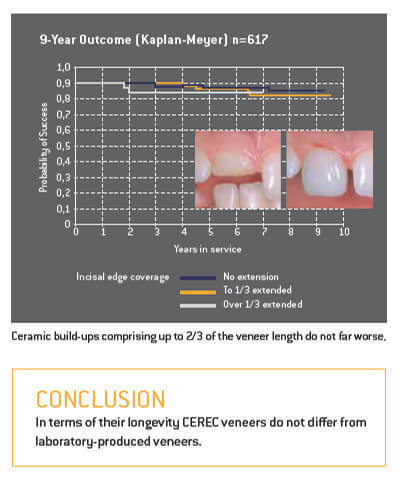 CONCLUSION CEREC veneers are a fast, tooth-conserving alternative to anterior crowns. VITA Mark II is the CEREC material with the longest track record. This feldspar ceramic is available in monochromatic blocks in a variety of 3D Master shades. This same material is also available in a polychromatic version (VITA Triluxe) with differently shaded layers. The monochromatic CEREC Blocs as well as polychromatic CEREC Blocs PC available from Sirona are also made of feldspar ceramic. They are available in the most popular Classical and 3D Master shades. The Ivoclar Empress CAD blocks (formerly called ProCad) consist of a leucite-reinforced glass ceramic material. They are available in the shades A-D, with two degrees of translucency respectively. Ivoclar also markets polychromatic blocks (“Multi”). The lithium disilicate glass ceramic blocks (e.max CAD LT) can be conventionally cemented. 1. Aesthetic enamel-like ceramics with a glass content in excess of 50%. The physical characteristics (e.g. strength, hardness, abrasion properties, opacity, and colour shade) can be modified by the addition of fillers. 2. Polycrystalline ceramics for frameworks. These consist of particles with an identical crystalline structure. These relatively opaque materials are much stronger than glass ceramics. 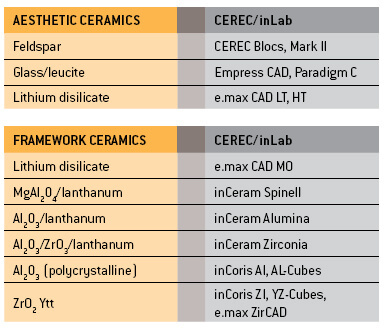 Nearly all these versions are available as conventional laboratory ceramics and as machinable CEREC ceramics. Polycrystalline zirconium oxide and aluminium oxide ceramics are reserved exclusively for CAD/CAM systems. CONCLUSION CEREC and inLab systems can machine all the relevant types of dental ceramics and hence are future-compatible and universally deployable. Veneering ceramics in particular have been criticized for causing wear to the antagonists and for being more abrasion-resistant than tooth enamel. As long ago as 1991 Krejci demonstrated that VITA Mark II displays the same abrasion properties as natural enamel. The surfaces of CEREC do not need to be polished or glazed. There is no difference with regard to abrasive wear and tear of the tooth enamel. The abrasiveness of VITA Mark II does not differ significantly from gold. The material itself is abraded at the same rate as gold. CONCLUSION CEREC ceramics do not damage the antagonists and display abrasive properties that are similar to gold.